Mourning is hateful and irksome to poor human nature. From suffering and sadness our spirits instinctively shrink. By nature we seek the society of the cheerful and joyous. Our text presents an anomaly to the unregenerate, yet it is sweet music to the ears of God’s elect. If “blessed,” why do they “mourn”? If they “mourn,” how can they be “blessed”? Arthur Pink, The Beatitudes. All of us mourn whether it be for the loss of a relationship or the death of a love one. That is not what is being referred to here. God will comfort us in those times of loss. As we struggle with our personal tragedies God has assured us that He is “the God of all comfort, who comforts us in all our tribulation, that we may be able to comfort those who are in any trouble by the comfort with which we ourselves are comforted by God.” (2 Corinthians 1:3-4). This mourning, however, is not that type of mourning. Like “blessed is the poor in spirit” this Beatitude must be looked on as a spiritual manifestation in our lives. It deals with our position before God with regard to our struggles with sin and how we realize those struggles in our lives. The mourning for which Christ promises comfort in this Beatitude must be understood in the realm of our relationship and position before God. The mourning that is blessed is the result of our realization of God’s holiness and righteousness as contrasted to the depravity of our nature and the enormous guilt of our conduct. This is another of those blessings that one who does not know Christ will not completely understand. This Beatitude should be seen as coupled with “blessed are the poor in spirit”. The blessing that Christ pronounced upon those who are poor in spirit was given to those that had emptied themselves with true humility before the world and before their Creator. The poor in spirit humble themselves by emptying themselves of their pride, self-esteem and self-assurance and by standing empty-handed before God. This is the connection between the poor in spirit and those that mourn. The mourning referred to here is brought about by our realization of the depravity of our spiritual state, and over our sinful lives that separates us from God. We mourn because of our poor spirit, our lack of humility, our self-righteousness and our low position before God even as He has lifted us out of sin. We sorrow for rebellion against God, and our hostility toward His ways even as we have been saved through the blood of Jesus Christ. This mourning is a realization of our brokenness, our total dependence on God, and our need for a Savior. In his ninety-five theses Martin Luther said that the Christian’s entire life is a continuous act of repentance and contrition. In his psalms David cried out, “For my iniquities have gone over my head; like a heavy burden, they are too heavy for me.” (Psalm 38:4) and, “For I know my transgressions, and my sin is ever before me.” (Psalm 51:3). Because we as Christians like David understand our true state we mourn. Our self-realization humbles us and we mourn. We are nevertheless blessed. Isaiah tells of the Messiah’s coming, among other things, “to comfort all who mourn; to grant to those who mourn in Zion – to give them a beautiful headdress instead of ashes, the oil of gladness instead of mourning, the garment of praise instead of a faint spirit; that they may be called oaks of righteousness, the planting of the Lord, that he may be glorified” (Isaiah 61:2-3). These verses speak of our mourning and our weak spirit. As our groans of mourning reach to our God in heaven, His unsurpassed and matchless comfort descends from Him by Christ to us. We must remember that ours is the “God of all comfort” (2 Corinthinans 1:3) for He has promised that. He in our time of mourning is always ready to meet our need, admonishing, sympathizing, encouraging, and strengthening us in our walk. Our God is a God of comfort, our Savior is a Christ of comfort, and the Holy Spirit within us is a Spirit of comfort. As believers we have the comfort of the entire Trinity! Like all of God’s blessings He is there for us as we face life’s encounters. Like all of God’s blessings they will be fully realized and completed when we see our Lord face-to-face. In the eternal heavenly state God “will wipe away every tear from (our) eyes, and death shall be no more, neither shall there be mourning, nor crying, nor pain anymore, for the former things have passed away.” (Rev. 21:4). As we go through this life we must do so knowing we have been promised that we need “not fear or be in dread… for it is the Lord your God who goes with you. He will not leave you or forsake you” and this will be perfected in the Kingdom to come. 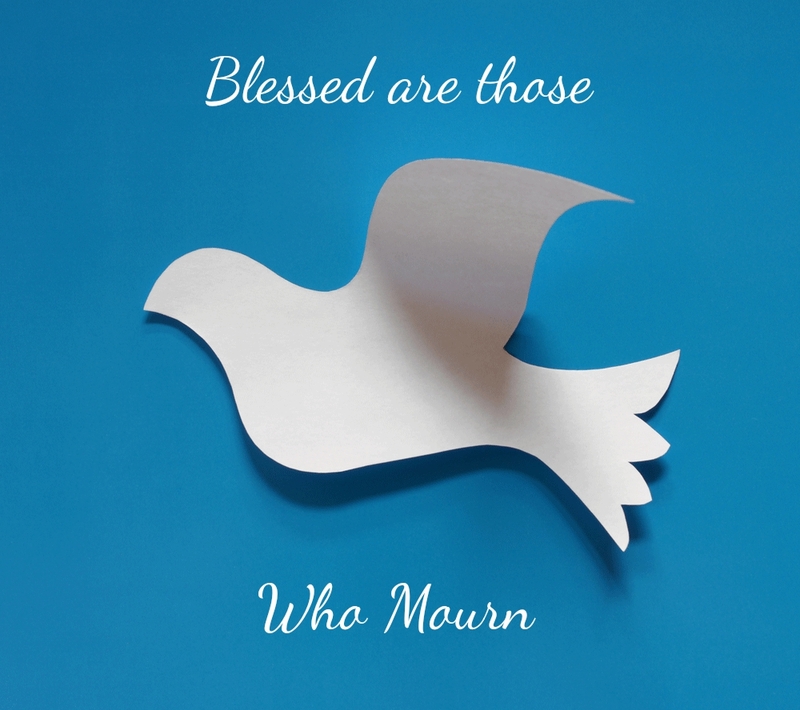 Blessed are those who mourn.